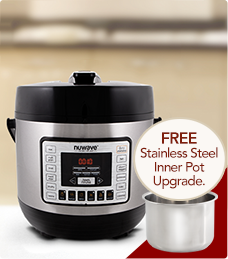 Here's your chance to upgrade to the Stainless Steel Pot! 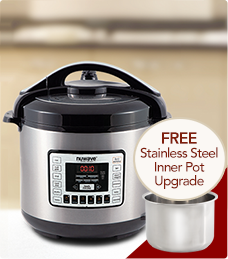 Made from durable premium grade stainless steel, this pot will not only last a lifetime, it will also add to the versatility and flexibility of your Nutri-Pot. 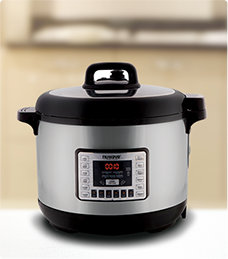 Pressure Cooking with the NuWave Nutri-Pot Cookbook contains 200 recipes written exclusively for the NuWave Nutri-Pot Digital Pressure Cooker, convenient cooking charts, guides and pressure cooking tips. Cook like a professional chef with the help of this handy cookbook. Protect Your Purchase! 2-Year Limited Warranty! Enjoy the peace of mind that comes with knowing your Nutri-Pot is protected for an additional 2 years. In order to provide you with the best service and quickest delivery times, all orders received by 2PM CST, Monday-Friday will be processed and shipped that day. Orders received after 2PM CST will be processed and shipped the next business day. Please note; to ensure quick turnaround, Hearthware, Inc. unfortunately cannot manage cancellations during the processing period. Offer only available for orders shipping to continental United States. Check here if your billing address is different from the shipping address entered above. Your card will be charged after you click on the 'PROCESS ORDER' button.